Mechanotransduction is a multi-step biological process by which cells sense, interpret, and respond to mechanical (i.e., physical) force through conversion to biochemical signals that elicit specific cellular responses. The responses are often mechanical in nature as they involve force generation to produce cellular protrusions and retractions which require remodeling of the actin cytoskeleton, consisting of monomeric (globular; G-) and helical polymeric (filamentous; F-) actin and actin binding proteins (ABPs). ABPs dynamically organize F-actin into many different structural forms such as lamellipodia, stress fibers, filopodia, podosomes, actin asters, vortices, and stars. These different architectures serve specialized roles in the cell’s multiplex response to mechanical stimulation. A primary means by which F-actin transduces these signals is through its connections to focal adhesions and adherens junctions, which coordinate contact between the cell’s actin cytoskeleton and either the extracellular matrix or another cell, respectively(Fig. 1). Understanding the actin cytoskeleton’s role in mechanotransduction goes beyond the basic biology underlying force-induced changes in actin-based cellular structures and functions. Diseases resulting from expression of mutant ABPs render cells unable to respond to mechanical forces physiologically. 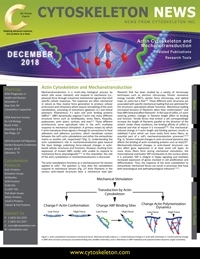 In this newsletter, the role of the actin cytoskeleton in mechanotransduction is discussed.